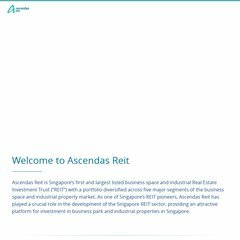 Topics: Ascendas Reit, Chinese, Awards & Accolades, Trust Structure, Milestones, and Chairman's Statement. The site has about 94 users daily, viewing on average 1 page each. pridns.ascendas.com, and pridns.qala.com.sg are its DNS Nameservers. The server is hosted by Singapore Press Holdings Ltd. Information Technology Division Singapore. Its IP Number is 202.27.31.20.